DPF filter (Diesel Particulate Filter) is a device integrated into the exhaust system of a vehicle with a diesel engine. Diesel Particulate Filter (DPF) designed to clear exhaust gasses by removing particulate matter or soot. You can find DPF filters in all modern diesel powered vehicles. There are two types of DPF filters. The first designed as single use DPF filters. You need to replace them periodically depending on ash accumulation level. Others are regeneratable. There is no reason to replace such filter because regeneration process can restore its efficiency. The main problem appears when the engine starts working improperly it can’t initiate the recovery process. DPF filter regeneration achieved by increasing exhaust gas temperature to reach a temperature at which accumulated particles burned completely. To start this process, some of the vehicles require speeds higher that ~64km/h and some cars have a “Parked Regeneration” function. In this case, engine runs at the higher rpm’s even when the car is parked to reach a higher temperature and higher exhaust gas flow speed. All EURO 6 trucks equipped with DPF filter. We highly recommend removing DPF filter from your EURO 6 truck exhaust system when you are installing the AdBlue emulator. Why does it need to be done? The answer is simple as it could be. Vehicle engine equipped with EURO 6 AdBlue emulator works in a different way. It does not use DEF (Diesel Exhaust Fluid like AdBlue), and it changes the structure of exhaust gasses. The engine can’t switch to the regeneration mode. It means that your DPF filter may clog up at the worst moment, in the middle of the long trip. 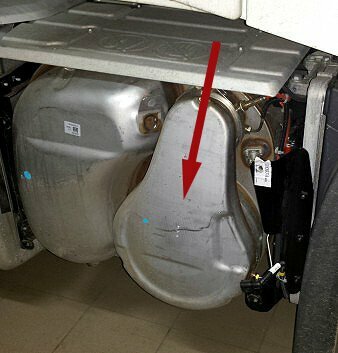 To avoid such unpleasant surprises, we recommend removing DPF filter right at the AdBlue installation moment. Removing DPF filter on any vehicle is easy. First of all, wait until exhaust system cools down if it’s hot. Now follow these three easy steps. Locate and remove diesel particulate filter housing cover. You can find it on the exhaust system module. Remove DPF filter from the housing. Just remove it, there is no need to cut something. Close the diesel particulate filter housing. Bring it back to the original location. Don’t forget to tighten all screews. That’s it. 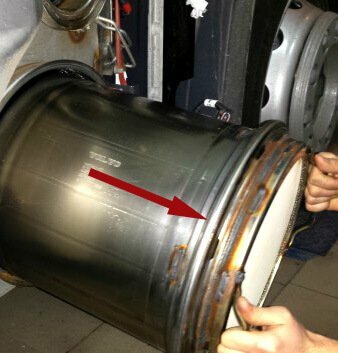 These are the images of DPF removing process carried out on Volvo EURO 6 truck, but on the other EURO 6 trucks, this process looks the same. DPF filter removal from the EURO 6 truck exhaust system was last modified: May 8th, 2017 by Cardiag Inc.